You don’t need to travel much or charge significant amounts to your credit cards to earn award flights; as TPG Senior Points & Miles Contributor Nick Ewen explains, there are several products that offer enough miles or points for a free flight just for meeting the bonus spending requirement. In this hobby, we constantly pursue freebies. Whether it’s first-class award tickets on world-renowned international carriers or luxurious hotel rooms for which we’d never pay cash, it’s always a rush when you can use your hard-earned points and miles for at least part of your trip. Fortunately, you don’t need to be a road warrior to take advantage of these redemption opportunities, as many travel rewards credit cards offer lucrative welcome bonuses that can boost your account (almost) instantly. Today I want to go through several top credit cards that can get you enough miles for a free flight with little effort on your part. Jetting off to paradise for free sounds like it’s too good to be true, but many credit cards can help make it happen. Image courtesy of Shutterstock. The former of the two allows you to earn miles in a specific airline’s program, and these cards often make sense if you’re based near that carrier’s hub. This is especially true if you’re interested in perks beyond just the free flight, as many of the cards provide waived baggage fees and other benefits that apply beyond the flight you’d get with the bonus. The latter category refers to cards that allow some type of transferability. When you earn points on these cards, you often have the option to use them directly to pay for flights but also have the ability to transfer those points to various partners (this will generally offer a better value). Though you won’t get the added perks that come with a co-branded card, they do allow you to wait until you know how you want to redeem your points before committing those points to a specific program. Finally, before getting to the analysis, it’s important to point out that the saying “There’s no such thing as a free lunch” does still apply to the points and miles universe. All award tickets impose taxes and fees of some sort, and while you don’t necessarily have to pay cash out of pocket to open a card, it will temporarily affect your credit score. Be sure to factor these into your decision-making process as you evaluate the best option for you and your desired travel plans. The AA Platinum Select MasterCard is a great option for a free flight, even with the upcoming devaluation. Current sign-up bonus: Earn 30,000 American Airlines AAdvantage bonus miles after making $1,000 in purchases within the first three months of account opening. Analysis: This card is a great option if you regularly travel on American given the array of benefits it offers. While the AAdvantage program just went through a significant devaluation, the 30,000 miles you’d earn from the sign-up bonus can still get you a free flight. Note that this sign-up bonus has gone to 50,000 miles before, so you may want to consider holding out in the hopes of another increase. The Explorer Card gives some great benefits and opens up some solid redemption options. Current sign-up bonus: Earn 40,000 bonus miles after you spend $2,000 on purchases in the first three months your account is open. Plus earn 5,000 bonus miles when you add the first authorized user and make a purchase in the first three months. 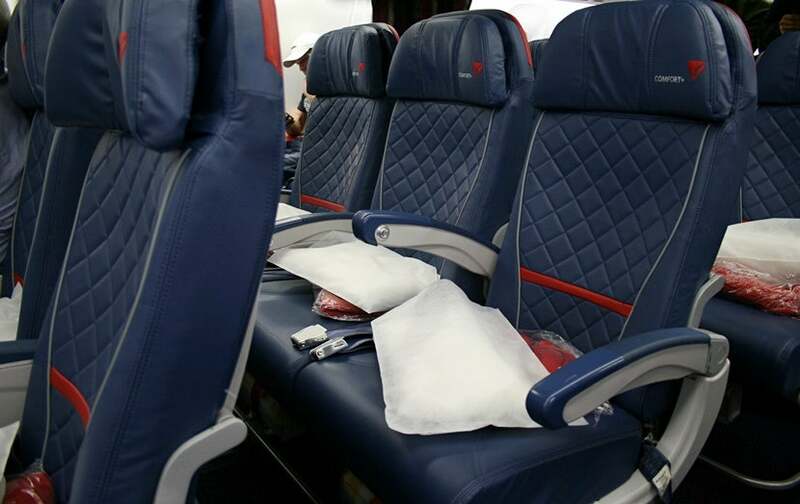 Delta has significantly devalued the SkyMiles program as of late, but you can still get some value out of the carrier’s co-branded Amex cards. Current bonus: Earn 30,000 bonus miles after you make $1,000 in purchases on your new card within your first three months, and a $50 statement credit after you make a Delta purchase with your new card within your first three months. Note that you may be targeted for a higher offer through a tool like Card Match. Southwest’s Premier Visa can get you multiple free flights, depending on your destination. Current sign-up bonus: Earn 40,000 points after you spend $1,000 on purchases in the first three months your account is open. Current welcome bonus: 25,000 Membership Rewards Points after you spend $2,000 on purchases on your new card in your first three months of cardmembership. Note that you could be targeted for a higher sign-up bonus through the CardMatch Tool or by loading the application page in a different browser. The SPG Amex card is a great option for free flights given the program’s 30-plus airline transfer partners and 5,000-mile bonus. Current bonus: Earn 25,000 bonus Starpoints after you use your new card to make $3,000 in purchases within the first three months. The Citi Prestige carries a host of valuable perks, but it’s also a great option for free flights. Current sign-up bonus: Earn 50,000 bonus ThankYou points after $3,000 in purchases within three months of account opening. Book an American flight: When you redeem points earned from the Citi Prestige for American flights, you’ll get a value of 1.6 cents per point. The sign-up bonus is thus worth $800, easily enough for a variety of destinations. Book a flight on another carrier: You can also redeem ThankYou points directly for other airlines, though you’ll only get a value of 1.33 cents per point. Still, the sign-up bonus translates to $665, a solid amount of effective “cash” to use for a free flight. Transfer to Virgin America: The sign-up bonus translates into 25,000 Elevate points, worth $375 – $575. Current sign-up bonus: Earn 50,000 bonus points after you spend $4,000 on purchases in the first three months from account opening. Book a flight directly: If you redeem your points directly through the Ultimate Rewards portal, you’ll get a value of 1.25 cents per point. The sign-up plus authorized user bonus thus gives you $687.50 to put toward your flight. Transfer to British Airways for flights under 2,000 miles: When you convert Ultimate Rewards points to British Airways Avios, you gain access to the carrier’s distance-based award chart. While the lowest tier is no longer available in North America, you can still get some great value on short- and medium-haul flights. Your bonus can get you 7 one-way flights of less than 1,151 miles or 5 one-way flights of less than 2,000 miles. Transfer to United: You can also convert Ultimate Rewards points to United miles, unlocking redemptions like a round-trip coach flight to Hawaii (45,000 miles) or a one-way business-class flight to Southern South America (55,000 miles). I constantly hear friends and family members claim that they don’t travel enough to earn anything, and in some cases they don’t even bother signing up for frequent traveler accounts (one of the biggest mistakes you can make). Fortunately, you can strategically utilize credit cards to build up your account balances, and there’s a wealth of products out there that can get you one or more free flights very quickly by taking advantage of lucrative sign-up bonuses. The hardest part of this may be deciding which ones work best for you! Which card would you sign up for to earn a free flight?